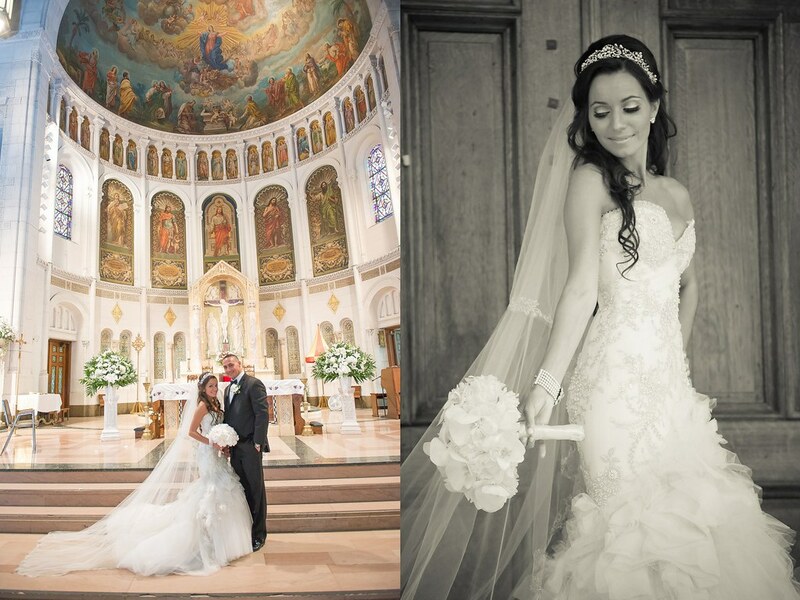 A best friend’s excellent matchmaking skills brought Maria and Joe together. Thanks to Joe’s incredible smile and personality, sparks flew. A surprise proposal in a park and they were soon-to-be-wed. It wasn’t long before the two set June 21 as their date. They planning process, however, took a little longer to get going! “The planning process was fun, but I will embarrassingly admit, I was very laid back and waited LAST minute for a lot of things. I thought we had so much time, but time passed so quickly. 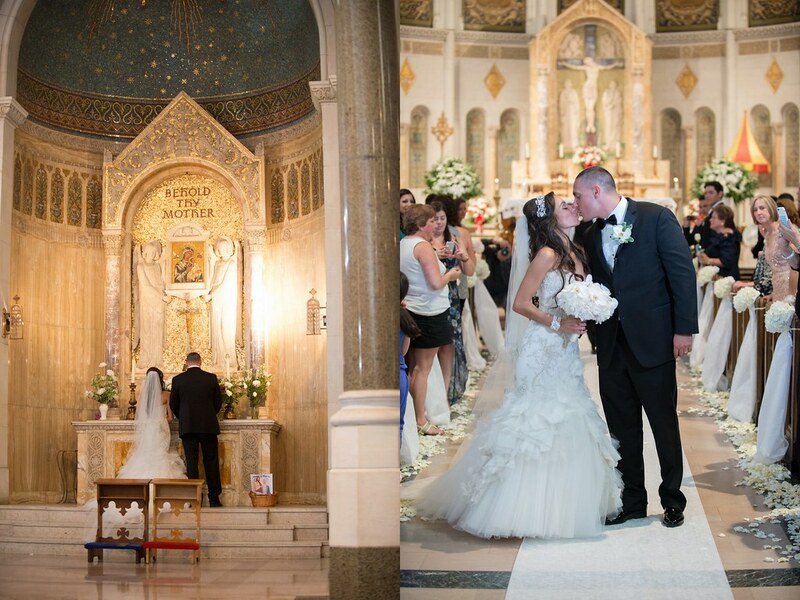 Our ceremony was held at Our Lady of Perpetual Help in Brooklyn, with the reception at El Caribe. I had always dreamed of a beautiful, elegant, and romantic wedding with white flowers everywhere. A beautiful ceremony in church was important to me as well. We incorporated my favorite flowers (orchids and peonies) in the centerpieces and my bouquet. For my bridesmaids, I wanted something airy and fun, since it was first day of summer. I loved how the color of the dressed would go with the all-white flower scheme. 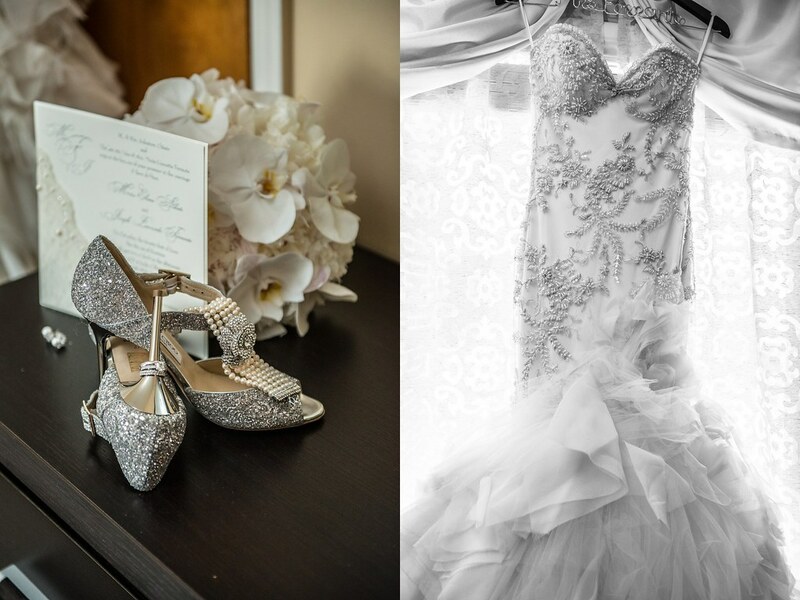 When shopping for the dress, Maria ‘s laid back approach won her one gorgeous gown! “I went to few places to shop for a dress to get an idea on what would look good. We finally went to Kleinfeld to check out a dress I had in mind, but was not blown away by it. I tried some others and then tried on my dress and instantly fell in love. My mom and sisters were also stunned by it and I immediately knew it was the dress. 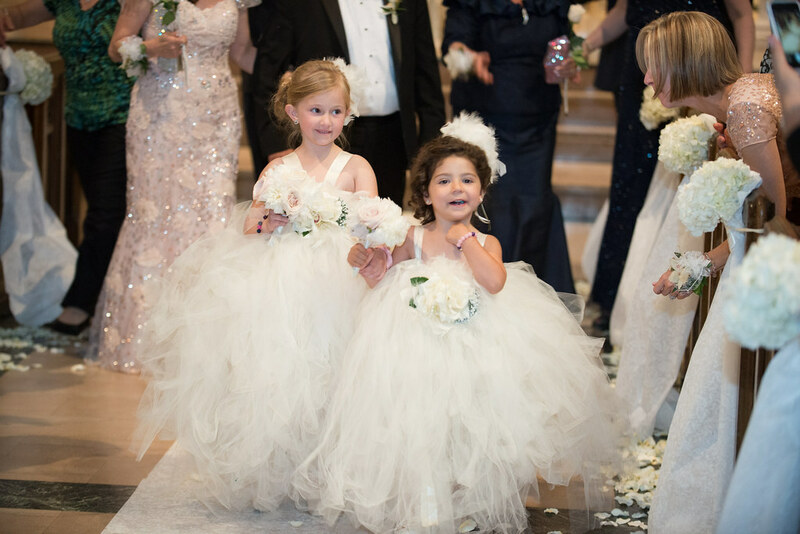 My dress was by Mark Zunino – Kleinfeld. The owners at Kleinfeld set me up with an appointment so he could personally fit me for my first fitting. He was fantastic. It was an amazing experience. 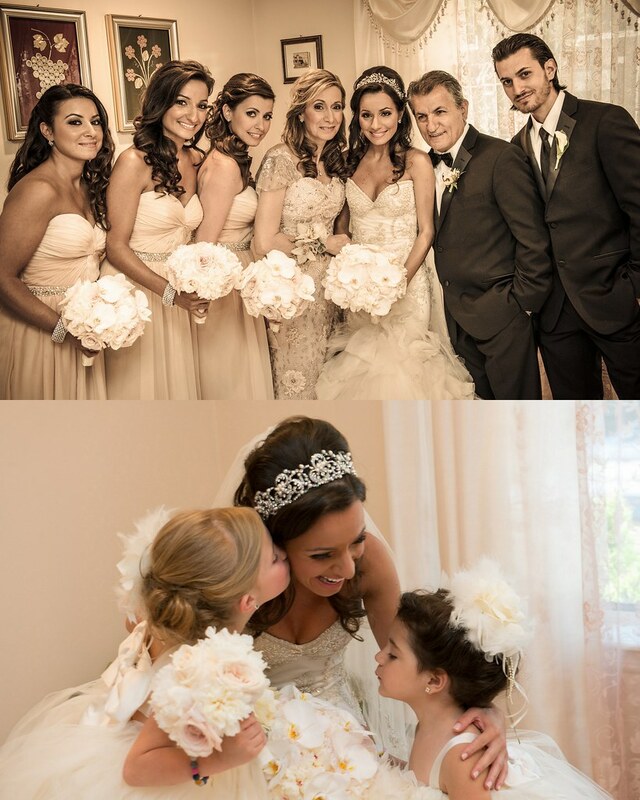 Next, Maria visited us at Bridal Styles Boutique, where she put the finishing touches on her glam wedding day look. When the day of their June wedding arrived, despite some worry over the weather, everything turned out exactly as they dreamed…and more. “We chose June 21st because we love Summer. We always look forward to summer, and figured we would have another reason to celebrate every year. We got lucky that it was a Saturday and jumped right on it. The week of the wedding, the weather kept saying storms for the day, and I was super stressed. Of all the things I should have stressed over, I didn’t – but the one thing I had NO control over, I stressed. The day of was magical – far better than anything I could have expected or dreamed of. I woke up to a beautiful sunny day and that instantly had me jump out of bed with the biggest smile on my face. My mom was getting the house ready for guests. Around 8am, our hairdresser and makeup artists came and started to do my hair, my sisters, my mom and bridesmaids. We had a great time getting ready. I was so calm and relaxed – and I just couldn’t wait to go upstairs and put on my dress. My dad walked me down the aisle to meet Joe. 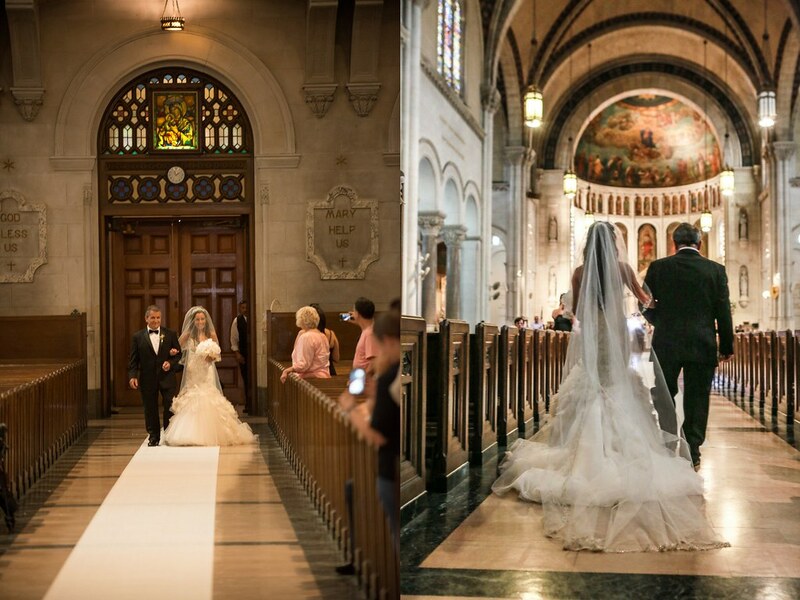 We were married by Father Tizio. 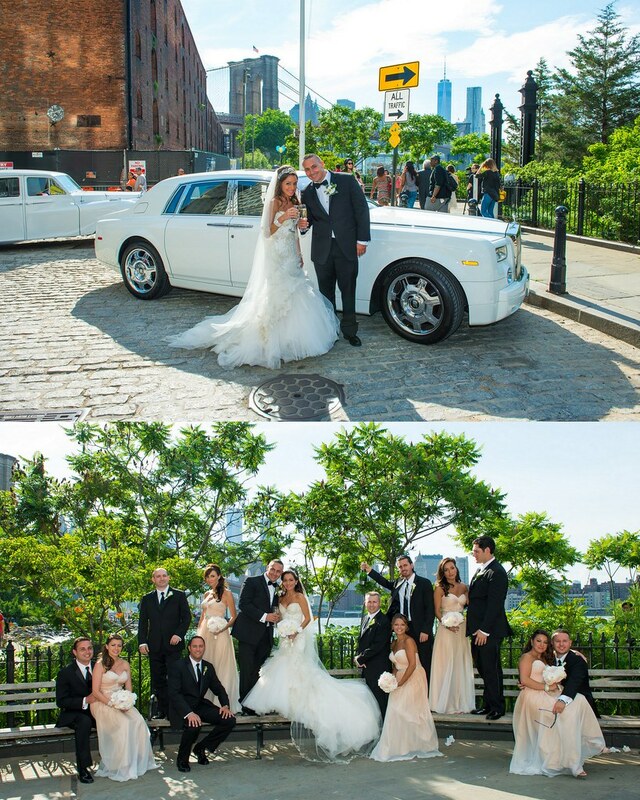 We took some family photos and headed over to Dumbo for pictures with our bridal party. Our photographer was great, and led the way through the shoots (and day for the most part) Thanks Saf! lol. 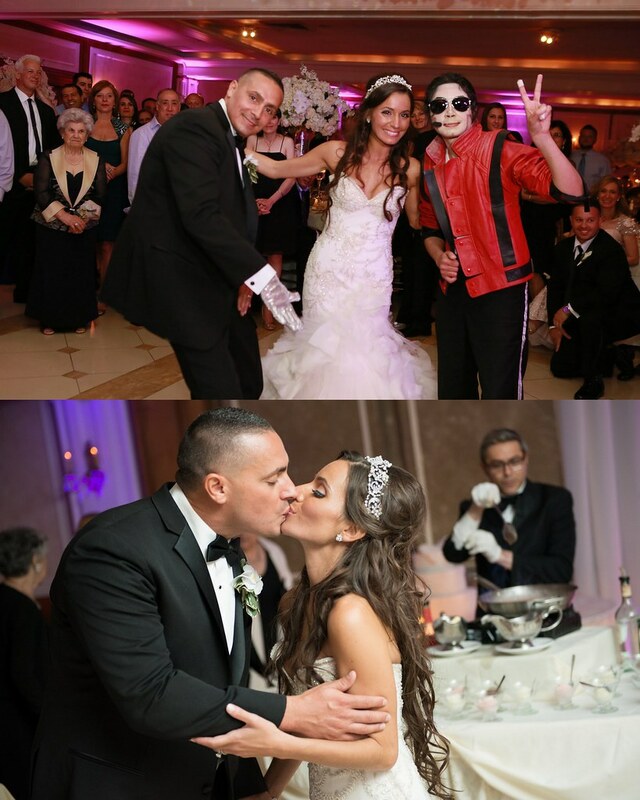 A mutual love of Michael Jackson took their wedding reception from amazing to epic. For Maria, seeing the two men she loves most together on her wedding day is a memory she’ll always hold dear. Thank you for sharing your day, and best wishes! This entry was posted on Monday, September 22nd, 2014 at 1:29 pm	and is filed under A Wedding Story. You can follow any responses to this entry through the RSS 2.0 feed. You can skip to the end and leave a response. Pinging is currently not allowed.